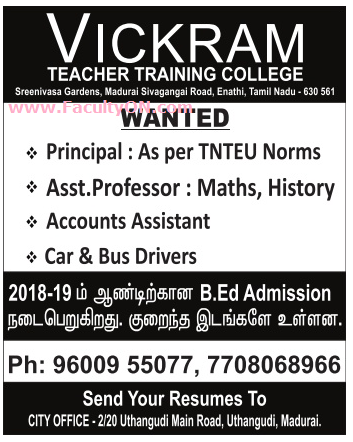 Vickram Teacher Training College, Sivagangai has advertised in the DINAMALAR newspaper for the recruitment of Assistant Professor / Principal Plus Non-Faculty jobs vacancies. Interested and eligible job aspirants are requested to apply as soon as possible from 22nd July 2017. Check out further more details below. Master Degree with M.Ed. As per TNTEU norms for Principal post. containing Xerox copies of the Testimonials, a recent passport size photograph to the following postal address.